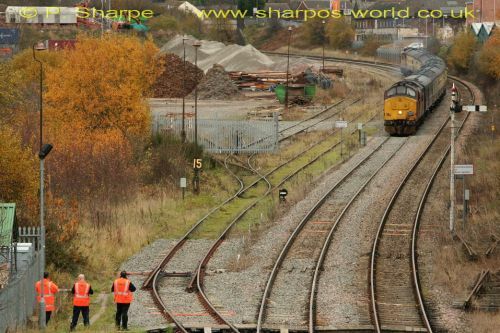 Freight to Moor Street yard Brierley Hill? Not yet. There were rumours of freight returning to the yard at Moor Street, with times appearing on Realtime Trains, but nothing has run yet. I was curious, after looking at the satellite view on Google maps I decided to go and see for myself, but the site doesn’t look ready for trains yet. The connection off the route to Round Oak is there, but I’m not sure about track in the yard itself. This entry was posted in Sharpo's World Photo Updates on August 4, 2017 by Sharpo. Been and had a look round today, the loop sidings are well and truly overgrown with trees between the sleepers so it looks like nothing happening any time soon. Traffic to round oak seems to have slackened off too. Thanks for the update Neal. Times still show on RTT each day, as they have done for nearly 2 years now. Probably won’t ever run?